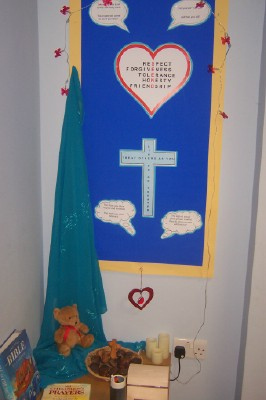 As a church school, we understand the importance of taking time out to reflect on our behaviour, our feelings, and our place in the world. 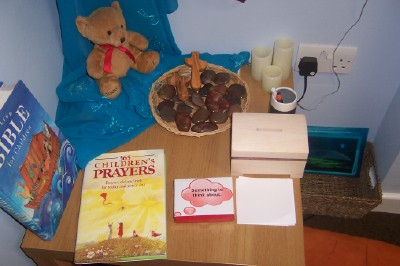 With that in mind, a special reflection area has been developed and shared with the children, where suitable music is played, candles can be 'lit', and a palm cross, a teddy, and a smooth pebble can be held, The Bible or prayers can be studied, and prompt cards to guide children through this time can be accessed. The area has cushions and a sealed box where worries, thoughts, and questions can be posted. We are also in the process of developing a multi-sensory spiritual reflection area outside by the school pond.